This Trophy has 3 Gold Stars around a Spinning Colored Soccer Ball on a Marble Base. It includes 3 lines of engraving. You can engrave the Player's Name, Team Name and the Season with Year. 3-Star Colored Soccer Ball - Approx. 8 3/4"
This Trophy includes a Figure of your choice with a Shooting Star Soccer Ball Backdrop on a Marble Base and includes 3 lines of engraving. Shooting Star Backdrop - Approx. 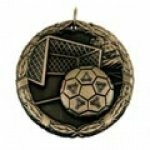 10 1/4"
This Trophy includes a Figure of your choice with a Shooting Star Soccer Ball Riser a Marble Base and includes 3 lines of engraving. Shooting Star Riser - Approx. 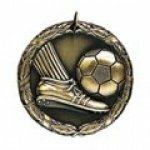 12 1/2"
This Trophy has a Soccer Ball atop Laurel Leaves on a Marble Base. It includes 3 lines of engraving. You can engrave the Player's Name, Team Name and the Season with Year. Soccer Ball with Laurel Leaves - Approx. 5 1/4"
These 2" Medals are 3D and portray great detail. They are available in gold, silver, or bronze finish. The price includes a ribbon or drape in a variety of colors to hang the medal from. You can personalize each medal by engraving the back for an additional $1.00.